What a whirlwind it has been traveling around the world for the past 2 months! Yesterday included 30 hours of travel back to my camper from Italy. 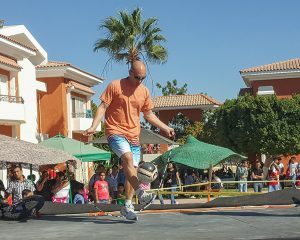 I had shows in Mexico City, Egypt and Italy since I left back in October. I will talk about my Italian adventures in a different post, but today I want to focus on a strange request for me to do some underwater jump rope during my show in Egypt. October was my 6th trip to perform in Egypt in the last 2 years. I’ve had a lot of fun performing for tens of thousands of people (over 15 million if you include those watching online). Because of how many times they have brought me over to perform, this trip I was asked to do some different stuff in my show. When you are performing solo, adding new element to a jump rope show can be a bit of a challenge. I have spent years developing my performance so that it is entertaining and engaging without being cheesy. Usually the way I add new elements to my jump rope performance is to have a couple more people to jump with. This allows me to do some Double Dutch, Chinese Wheel and other elements that are impossible when I am performing by myself. I’ve never done any underwater jump rope during a live show before! Personally, I’m game for pretty much anything. If they really wanted some underwater jump rope action, who am I to say no. I explained in detail that it probably isn’t the most exciting thing in the world to watch, especially for an hour. They understood my concerns, but still wanted me to incorporate it. My wife and I discussed the options and settled on doing this as the last element in my performance. That way if people did get bored, they could leave whenever they had seen enough. After much discussion they decided to setup a stage next to a swimming pool they have on the site. It turned out to be a great location because the pool naturally had a buffer zone where people couldn’t stand so there was a lot of front row “seating”. Almost everyone stood for my entire 45 minute show so seating is a bit of a misnomer. My primary concern was related to how would people see me doing the underwater jump rope stuff. Thankfully, the Egyptians are a very creative bunch. 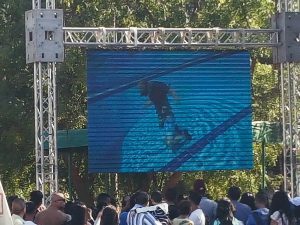 They had a massive screen setup next to the pool with a camera that went into a plexiglass box. The box was partially submerged into the pool and the camera had a great view of everything I was doing underwater. Their original idea was to fully submerge the box, but they underestimated the buoyancy of it. It was a pretty good sized box and thus had quite a bit of water displacement. The amount of weight required to sink such a box was a bit absurd. As they kept adding weights (and a small human), the box just wasn’t sinking. I had the bright idea to just submerge the box partially since only the camera needed to be under the water. This helped things out tremendously. 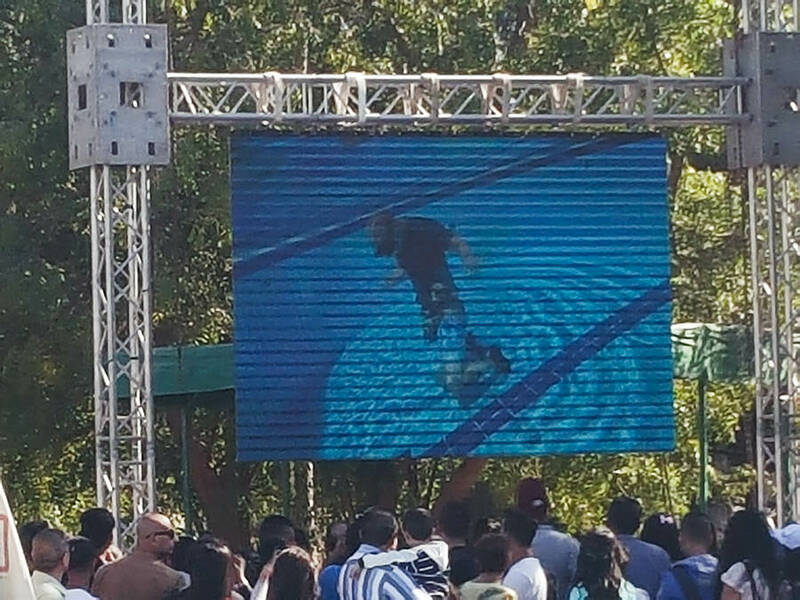 All that to say, they had a camera so that everyone watching my show could see all the underwater jump rope they could want. One thing that didn’t really cross my mind until we landed was the time of year. I’m supposed to hop into a swimming pool and it’s almost November. Yes, it is Egypt and it doesn’t really get super cold, but it still can be chilly in the morning. Not cold by any stretch, but not necessarily pool weather either. This was one more reason to do the underwater jump rope routine at the end of the show…I’m usually hot and sweaty by then. It turned out to be quite refreshing being able to hop in the water after jumping rope for 40 minutes. There were 2 other issues I ran into with doing this. First, I completely spaced on needing weight to stay down. When I did the Guinness World Records attempt, I used something like 10 kilos (22 pounds) of lead weight. I did not bring a weight belt or any lead with me to Egypt. We ended up grabbing some dumbbells out of the weight room and using my belt to hold them on. Not the most stylish thing in the world, but it worked. The second issue I ran into was how to close my show. Normally I pick up my microphone at the end and do a quick goodbye. This time I was going to be soaking wet and a fair distance from the stage. I initially thought people would quickly disappear after getting bored of watching me do the underwater jump rope exhibition. It turns out that pretty much no one left. This was something I found out during the first show. I hadn’t even considered that they would stay and watch as long as I kept going. In the end, I waved at the underwater camera and then had my translator say goodbye in Arabic for me. This worked out pretty well and we kept the same thing for the rest of my shows. All in all, it worked out quite well. I don’t plan on doing this at any other live shows unless it’s specifically requested. The logistics are not very realistic for most locations. Still, it was quite an experience and I had a lot of fun! The Jump Rope Master came out to do a show today. He is terrific at getting the kids actively engaged and getting them focused on what he was doing. He had some really exciting tricks to show the kids, but with a message about working hard that can apply no matter what area you're trying to succeed at. I highly recommend it, it was a great show.